Does your phone repair business need to be on social media? Well, 92% of small businesses say social is critical to their success. And with the sheer ubiquity of social media — the obvious answer might be a resounding yes. But, knowing you should be on social media doesn’t help to explain the why or the how. Let’s cover what it is. It’s sharing content on social channels to ultimately, bring more traffic into your store. Before you get into the nitty gritty of it all — remember that it doesn’t need to be any more complicated than that. Like content marketing, social requires little monetary investment compared to other marketing tactics. But, like content marketing, what you save in money, you make up for with time. Social media marketing requires a consistent time investment. So, if you’re relatively low on resources but are willing to dedicate the time — social media could be the answer. Let’s start with why. Whether it’s through your search ranking, content or social presence. The online space is all about building your credibility. Updating your followers on the latest news on your business builds your brand. Just having social presences adds to your legitimacy by way of social proof. Your social presences tell prospects that you are a legitimate business. And one that actively engages with its customers. Picture this: your site has gone down. A problem with your web host has left it inaccessible. How will you notify your customers? How will you reassure those checking on the status of their phone repairs? How will you minimize the potential damages to your brand? You could send an email. But, that would only reach those on your list and not new prospects. You could wait till the problem disappears and hope no one tried to access your site. Or you could send out a post on social media, publicly accessible — and instant. Your customers and new prospects could know immediately that you’re aware of the issue and working on a fix. Social can both communicate your value proposition and keep your community informed. Social media acts not only as a platform for customers to voice their opinions on your business. It can also act as a 1-to-1 communication channel between them and you. You have a direct line to help resolve queries, requests, and complaints. And the quicker you address them, the better your customer service will be. Social media attracts website visitors with powerful images and clickable headlines. When you share your content through social channels, those clicks lead back to your site. And once they’re on your site, they can start to move through the process of becoming your customer. Social signals are also one of the factors search engines use to determine a site’s authority. And as you know by now, the greater your site’s authority, the higher your search rankings. To reiterate, social media marketing demands a time investment. How much time? The most when you’re starting out, and then a little bit each day. 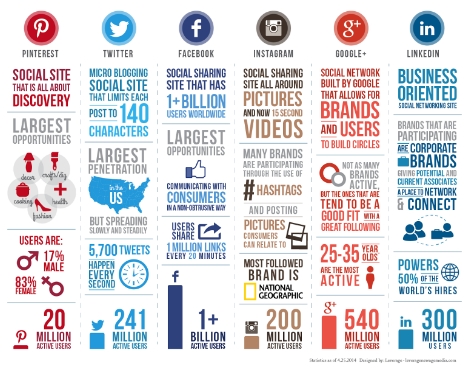 Which social channels do they use? — Which platforms do they use? Facebook? Instagram? Twitter? Pinterest?. Social media marketing centers around sharing relevant and valuable content. To know what is relevant, you must understand your customer’s objectives. To make it valuable, you must understand their pain points. There is no value in targeting platforms your prospects don’t frequent. It will only be a waste of your resources to pursue them. When starting off it’s best to focus on the 1 – 2 platforms that your audience uses most. If your audience prefers to use Twitter for updates or Pinterest for content — that’s where you want to be. The kind of content they want and where to find them all begins with understanding. An understanding of why they use a specific channel. And how they use it. Once you know which social media channels you’re going to focus on, it’s time to prepare your website. Because the success of social isn’t dependent on the social platform alone. It’s a synergistic effort between both it and your website. Remember, at the end of the day, social is about bringing in more traffic. Social media is sharing. Simply, the more people that share your content the better. It’s how you bring in more traffic, build your thought leadership and grow your business. Social is not only a tool for sharing but one for listening. It’s a tool that enables you to track brand mentions throughout the web. It allows you to monitor what your customers are saying about your business and address any concerns. Tools like Buzzsumo or Mention can help with this. They notify you when there is a mention of your business anywhere on the web. This can give you a deeper insight into the kind of content to share. For example, let’s say your business frequently appears with questions about repair times. This could be an opportunity to share relevant content that answers those queries. Here’s when the daily time commitment comes into play. You should commit a period of time each day to social media. When you’ll use your understanding of your target audience to share relevant content. So how do you find this content? You may not need to look any further than beyond the walls of your shop. If your business’ procedure is to take before and after photos of repairs — share it. If you’ve created your own video tutorials on DIY repairs, phone tips and tricks — share it. If it’s valuable to your audience — share it. Now, of course, if you find lots of great content that you want to share, it might not be the best idea to do so all at once. This could diminish their value or simply get lost in all the social noise. Social scheduling using tools like Hootsuite or Sproutsocial. They allow you to schedule tweets and posts days, weeks or even months in advance. Not only can this be a huge time saver it also gives your social presences an air of consistent activity. You could spend one day scheduling all your week’s posts and not have to worry about it for 7 days. But, depending on your chosen channels, you’ll also want to set relevant goals. For example, if you’re on Twitter, aim to tweet and retweet a certain number of posts each day. Being active in all facets of your chosen channels is how your build your brand’s social presence. Social media marketing’s effectiveness is about figuring out what works. Doing more of it and less of what doesn’t. To do this you should track your traffic data. Use your website analytics and social media metric reports. They will help you determine which channel and what content brings in the most traffic. Don’t forget to look at the most obvious social metrics too — number of shares. This can improve your effectiveness on each channel. So, if you notice that content you’re tweeting out on DIY phone hacks gets the most attention then share more of it. Simple. So, should your phone repair business be on social media? Short answer — yes, it should be. Social is now a core component of any digital marketing strategy. It’s cost-effective and your customers expect you to have a social presence. They expect it. Now, building up your following will take time. The key is to truly know your audience. Reach them through the right channels. And then share valuable content. Do it on a consistent basis and that’s how you’ll set your business up for social media success. It’s as simple as that.